Hello! Today I have another Danglefoot Nail Polish to share with you. If you missed my swatches of the Sugar & Spice Collection last week, you can find that post here. Hayley released a few other polishes at the same time, including a bright pink called 'Barbies Hangover'. I also ended up stamping over it. Read on for my full swatch and more info! 'Barbies Hangover' is a bright pink with gold shimmer. This has a super smooth and easy to apply formula, and is fully opaque in two quick coats. The gold shimmer translates really well to the nail. Below is two coats with topcoat. This polish is very much on the girly side, and I couldn't resist adding some princess themed stamping. 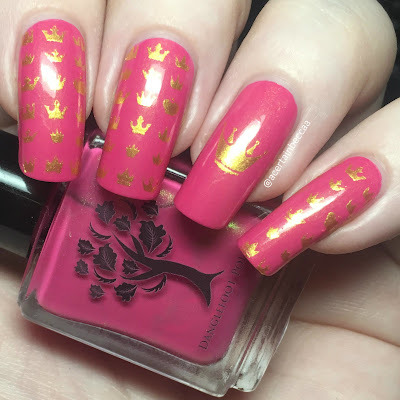 I used Uberchic Beauty plate Fairytale 01 (purchased from Rainbow Connection) along with a Born Pretty Store gold stamping polish and clear stamper. What do you think? 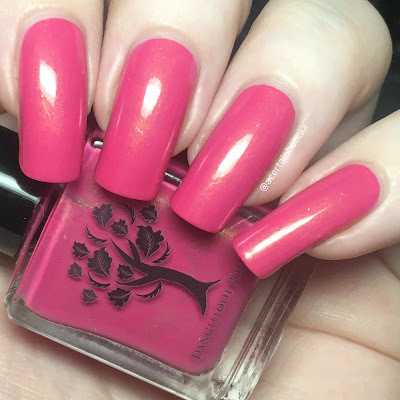 I love a good pink polish, and I definitely felt like a princess with this on my nails. I think matching the stamping to the shimmer worked out really nicely. This is definitely a polish I'll be reaching for again and again. Hayley is currently on maternity leave, but the Danglefoot Nail Polish store is open momentarily for a new baby trio which you can find here. You can also find her Instagram page here. Very pretty po9lish and I love it with the stamping. So girly and pretty!